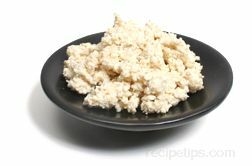 The white by-product, resembling wet paper rags or sawdust, that remains after draining off the liquid when making soybean curd, commonly known as tofu. Often referred to as soy pulp, Okara consists of the fiber, protein and starch extracted from soy milk as it is processed into tofu. Okara is used in Japanese foods for soups, salads and vegetable dishes, but is not typically used in Chinese foods. Okara is also a type of feed used for animals in many Asian regions.